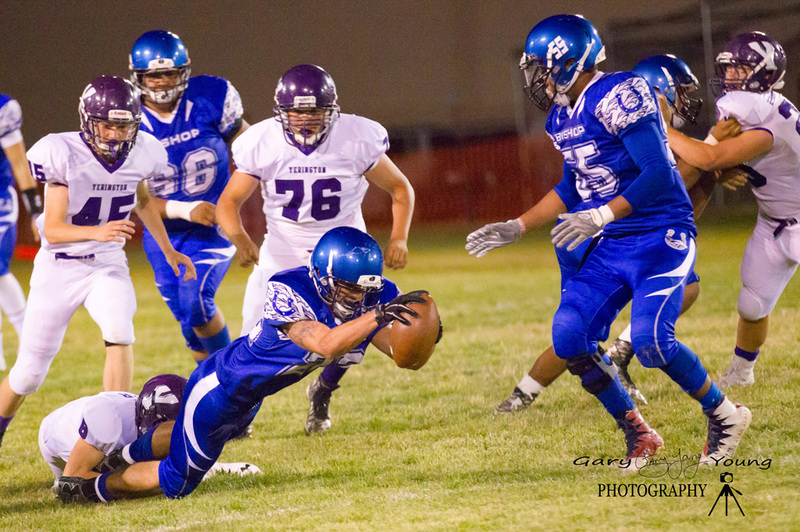 Bishop Broncos get their first victory of the season Friday night at John Schwab Field in Bishop. Lorenzo Parra ready for opening kickoff. 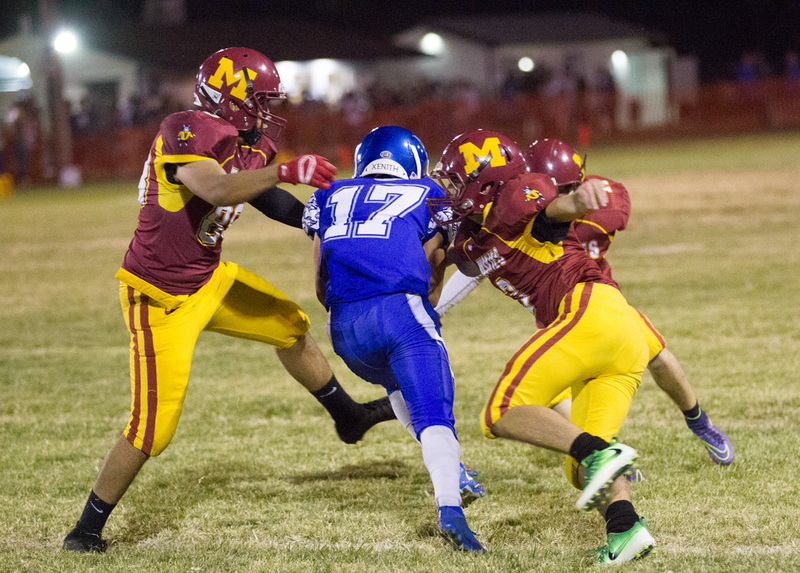 Mario Velasco makes a great tackle as Moran West looks on. Sean Brown with one of his 11 carries on the night. It’s hard to tell by the picture but Ryan Rennie makes the interception to set up a Bronco TD. 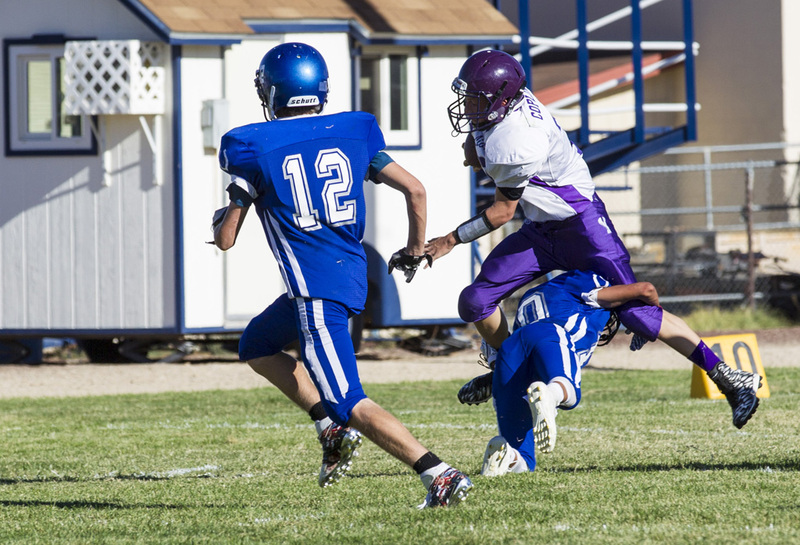 Rennie again, all over QB Christian Orrick of the Huskies. 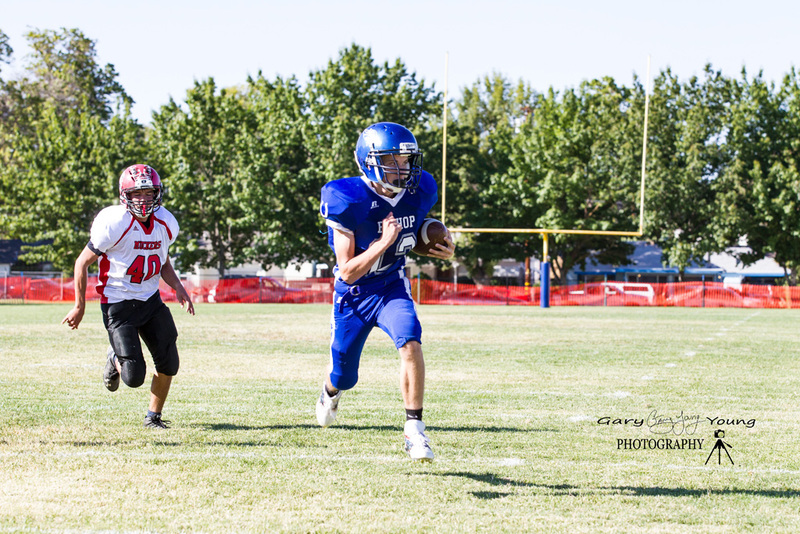 Izaak Morganstein runs around the corner for a Bronco score. Mike Molina fights off two and gets the sack. 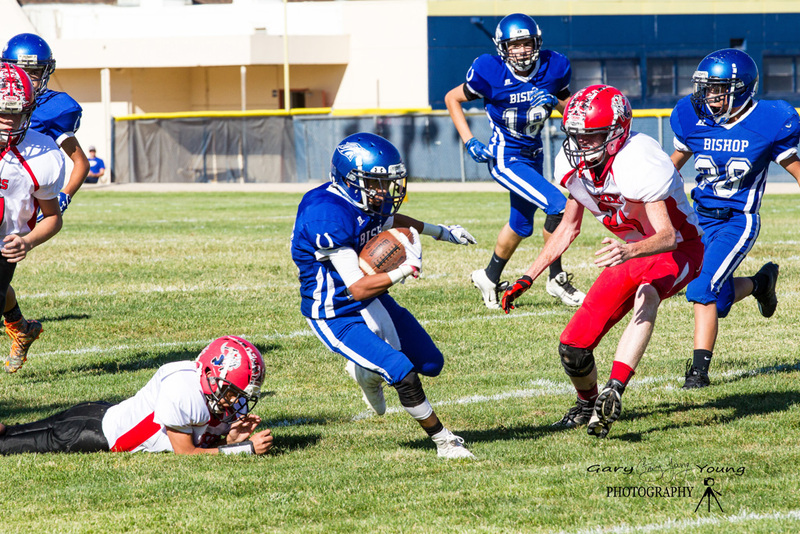 Mario Velasco plows through the Mammoth defense. Orrick of Mammoth will be up close and personal with Parra quickly. And that’s all she wrote !! 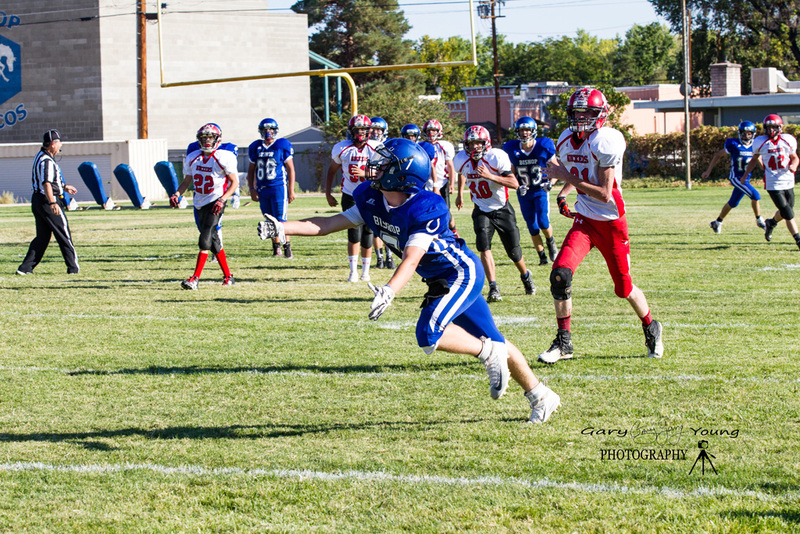 Bishop Junior Varsity team scored first and often during their Friday afternoon victory over the Tonopah Muckers in Bishop. 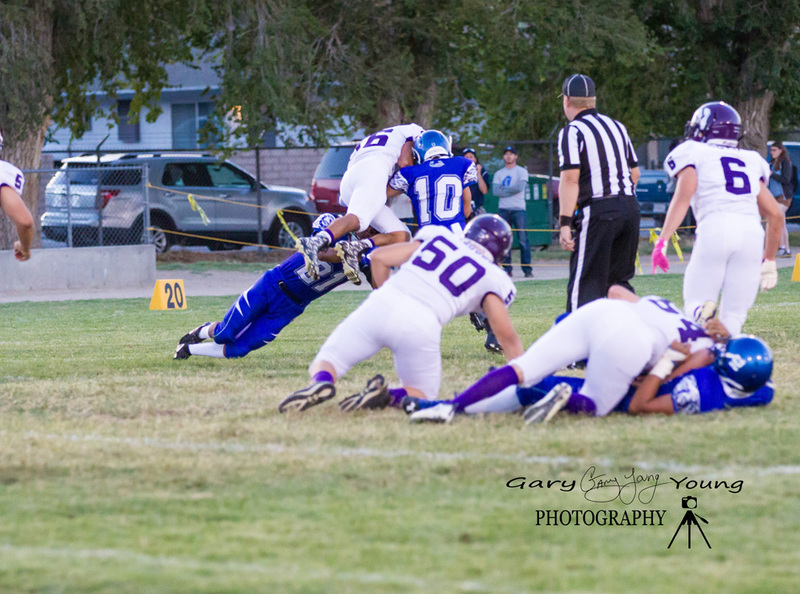 Yerington rolled into town and beat the Bishop Bronco’s in the 1st home game of the season Friday Night 09/02/16. 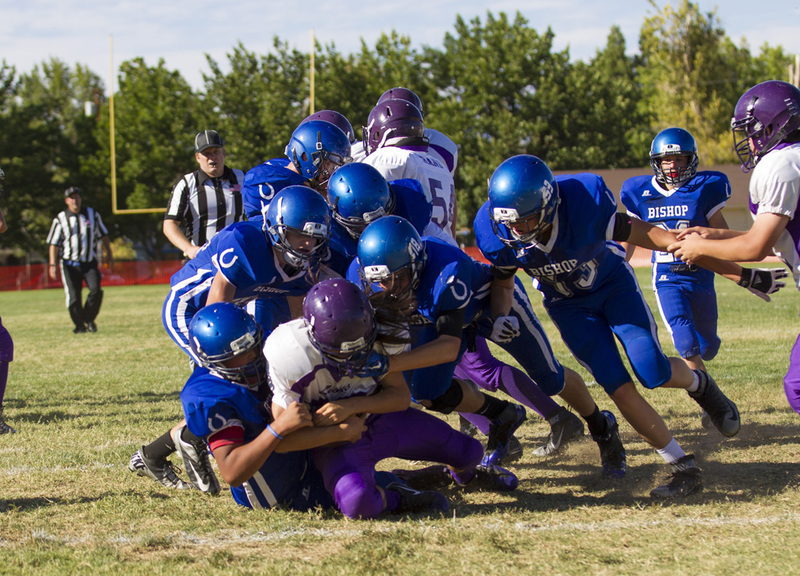 Down 20-6 at the half, the Bronco’s started the 2nd half with some fire and determination but it wasn’t enough as Yerington rolled to a 33-14 victory. 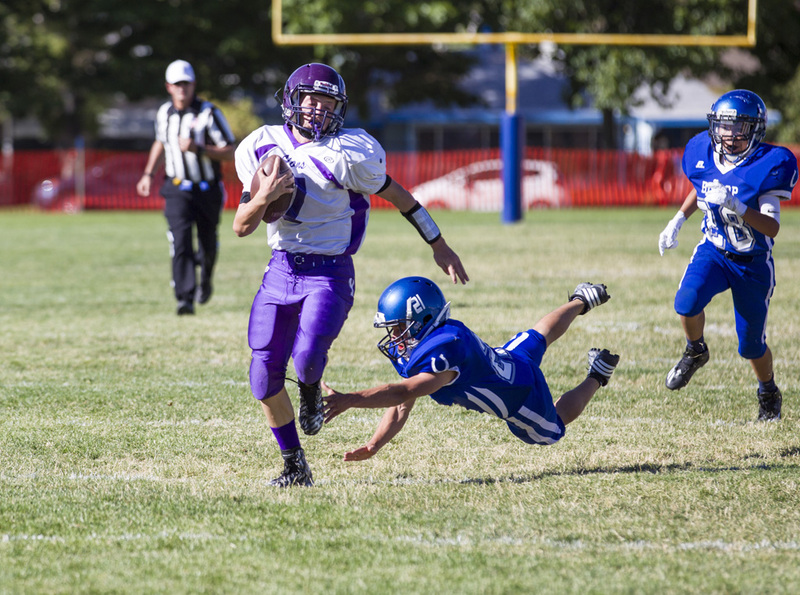 The Yerington defense kept the Bronco running game in check for 4 quarters. 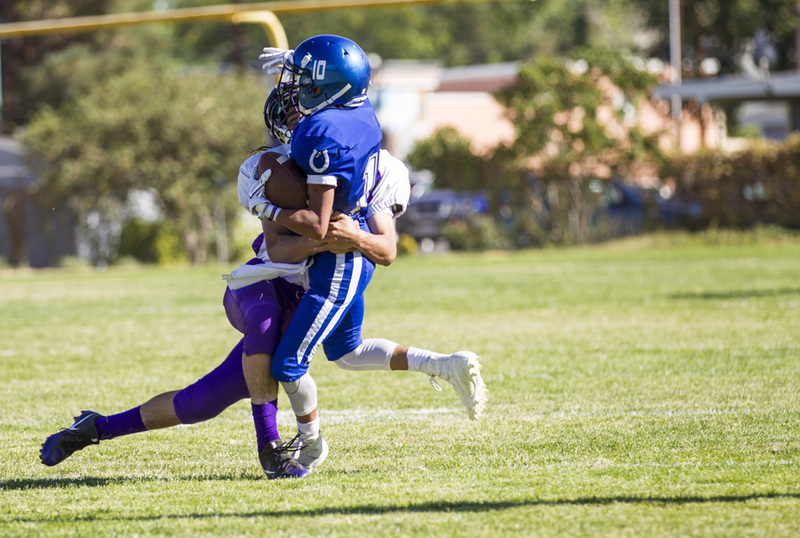 Receiving – Izaak Morganstein had 5 catches for 95 yards and 1 TD. 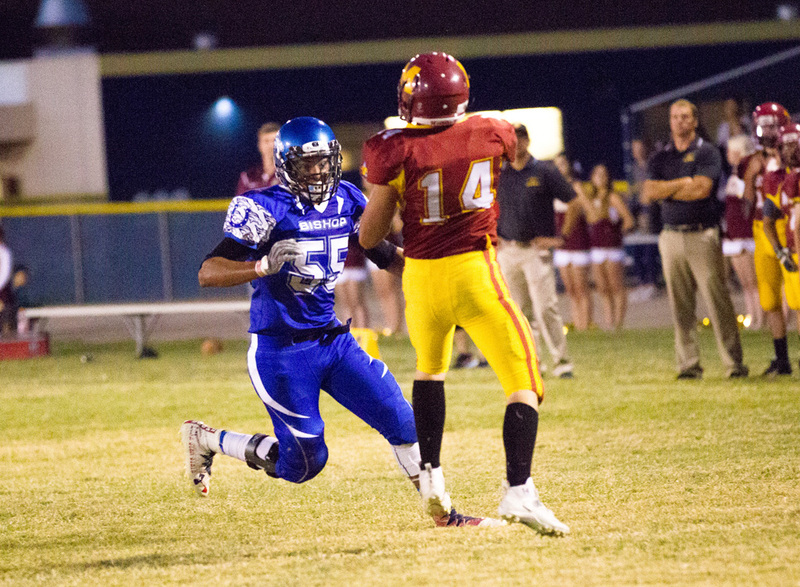 Morganstein accounted for 132 all purpose yards on the night. 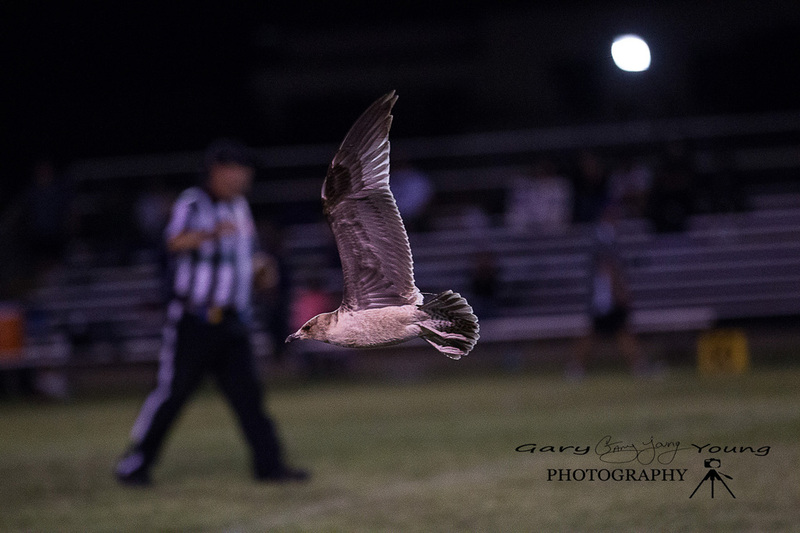 Even the crazy bird couldn’t help the Bronco’s on this night. 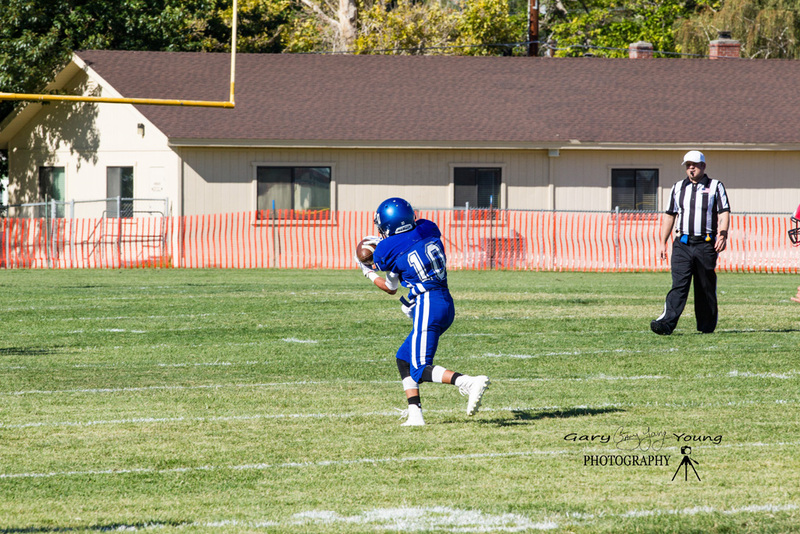 Mario Velasco makes the catch from QB Ryan Graves. Ryan Graves running the option on offense. 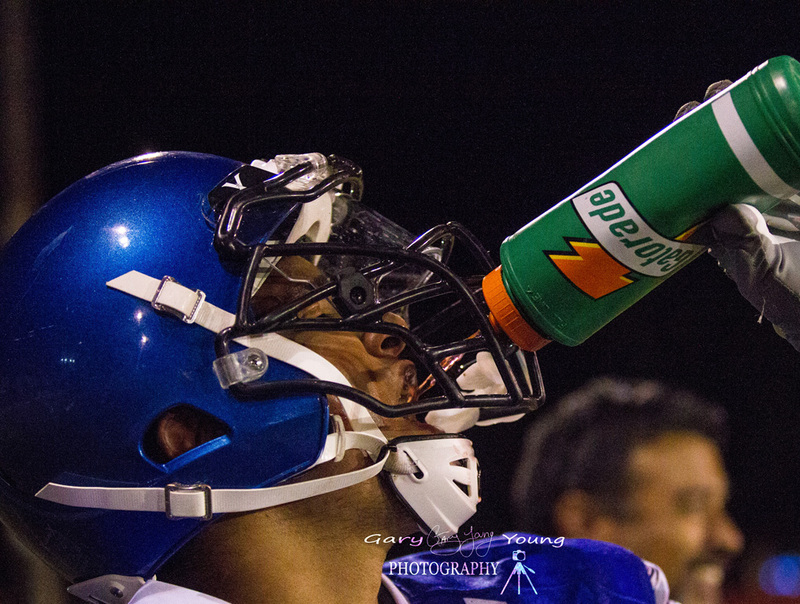 Lorenzo Parra getting some needed fluids. Joe Mayhugh from the linebacker cam. 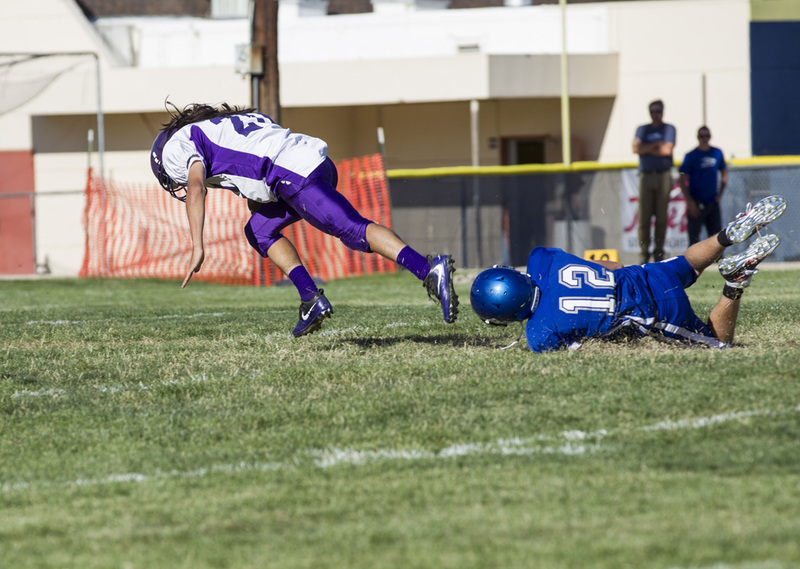 Arturo Lemus was all over the field making tackles. 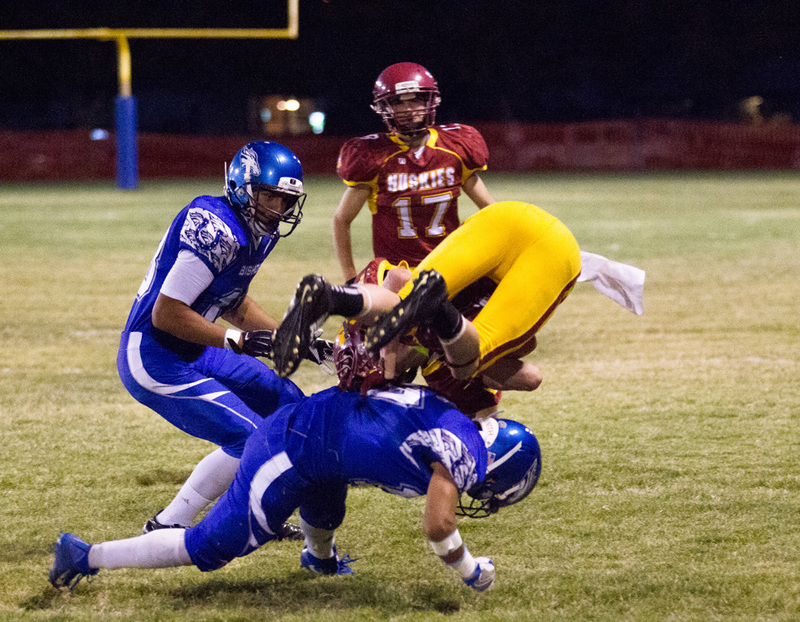 #21 Alan Torres and #10 Moran West doing work on “D”. 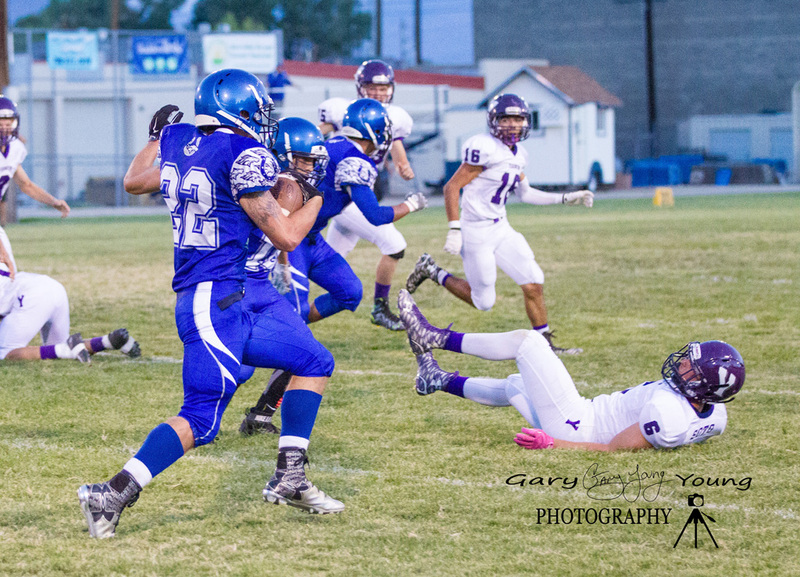 Izaak Morganstein evading a Yerington tackler as Sean Brown looks for his next block. 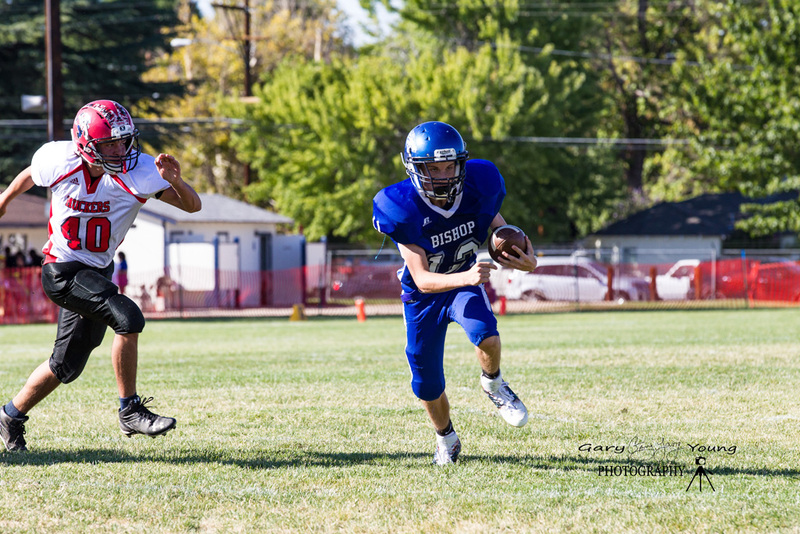 Izaak Morganstein powers through for a couple extra yards. 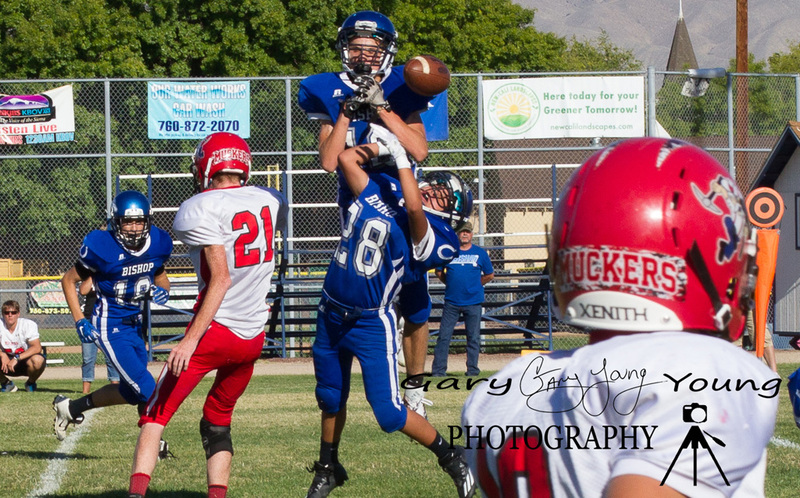 Izaak making the grab on a nice deep out pattern. 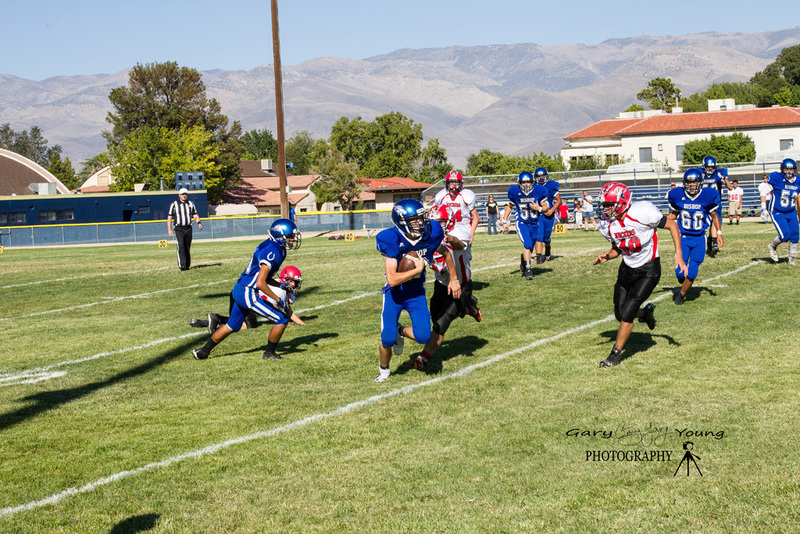 Izaak again carrying a few defenders for a few more yards. 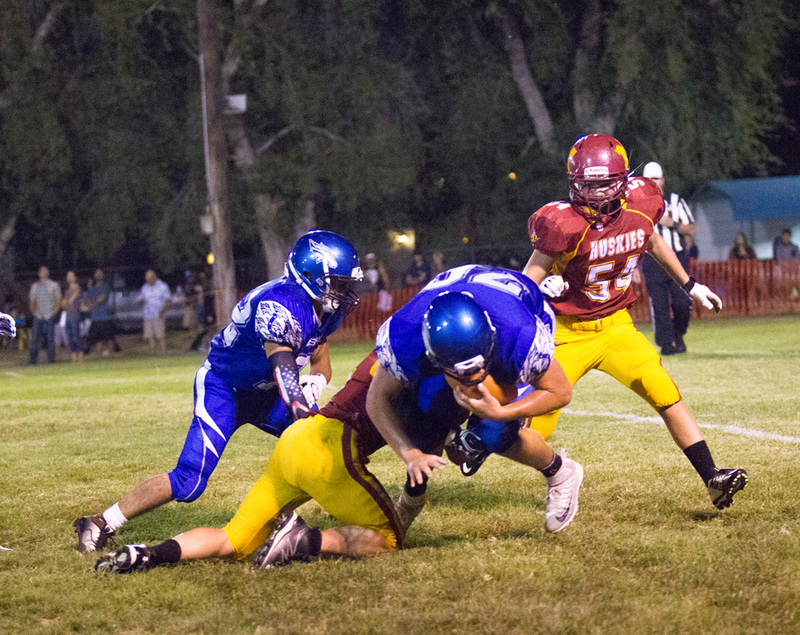 Moran West getting a shoulder on # 4 Michael Monahan who ran for 220 yards and 3 scores against the Broncos. Sean Brown stretching for the 1st down in the 3rd quarter. 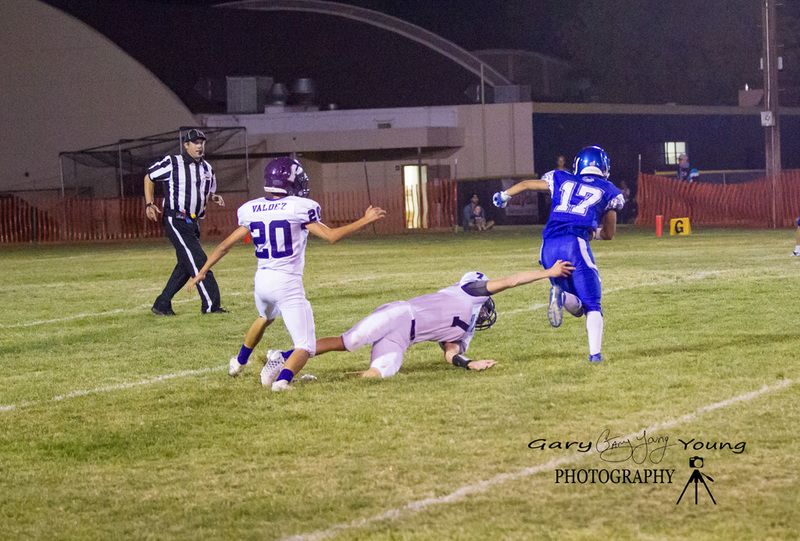 Arturo Lemus laying out a Yerington defender for Sean Brown on a kick return. Photos by Gary Young Photography. All photos available at Gary’s website ! 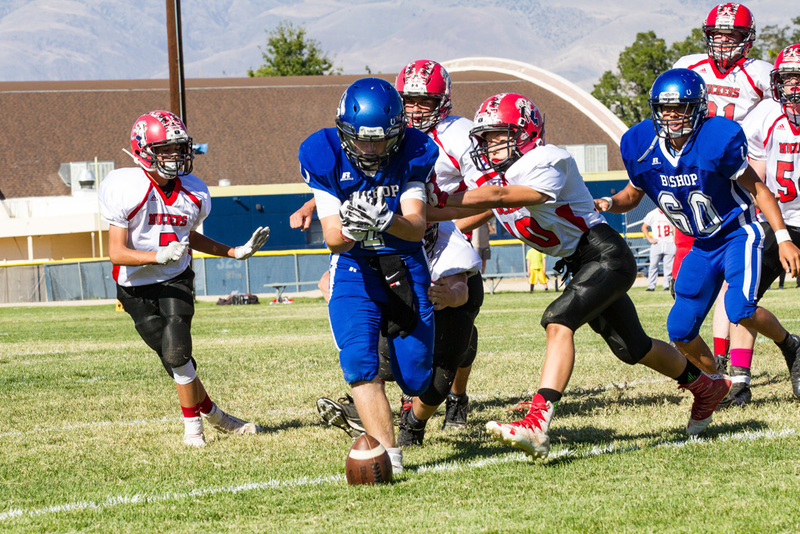 The first game on home turf was a great one with the Bronco JV squad getting a 24-22 victory over the Yerington Lions. 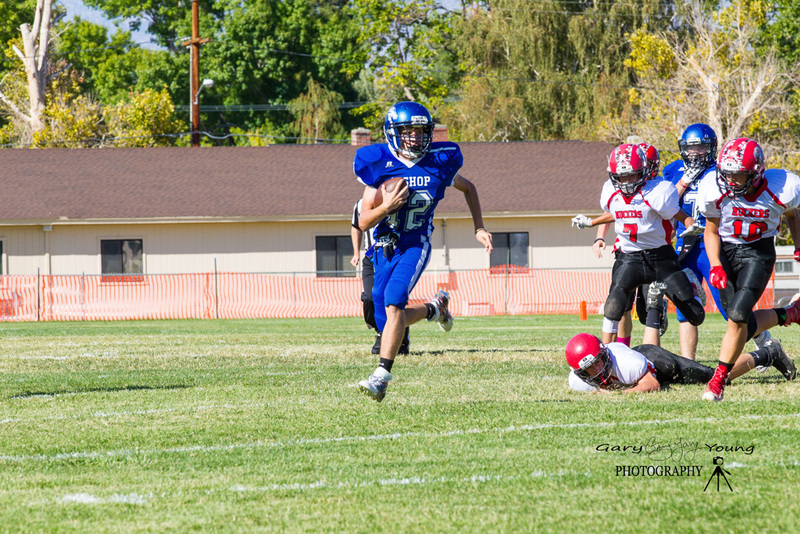 Rushing – Luke McClean ran for 84 yards on 10 carries with 1 touchdown. 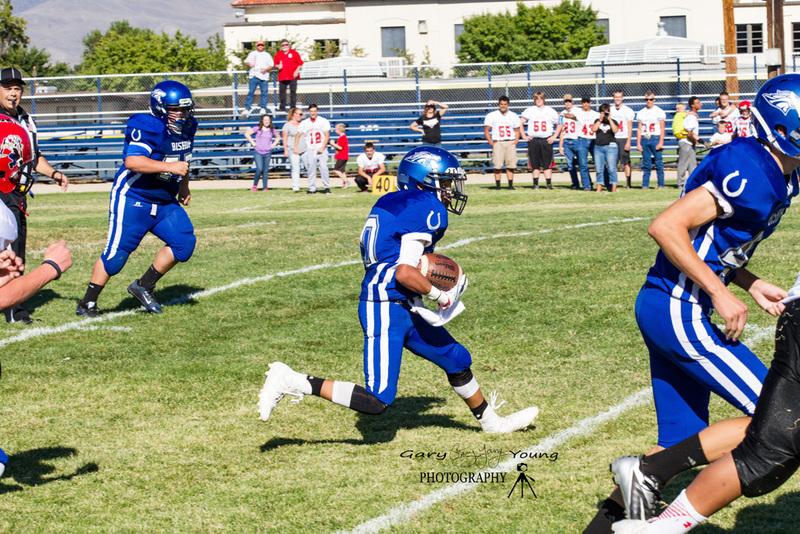 Mark Mayhugh rushed for 49 yards on 4 carries with 1 touchdown. And Wesley Pettet had 43 yards rushing with 11 carries. Defensively – Pettet was the leader in tackles with 11. Max Torres out for the season. 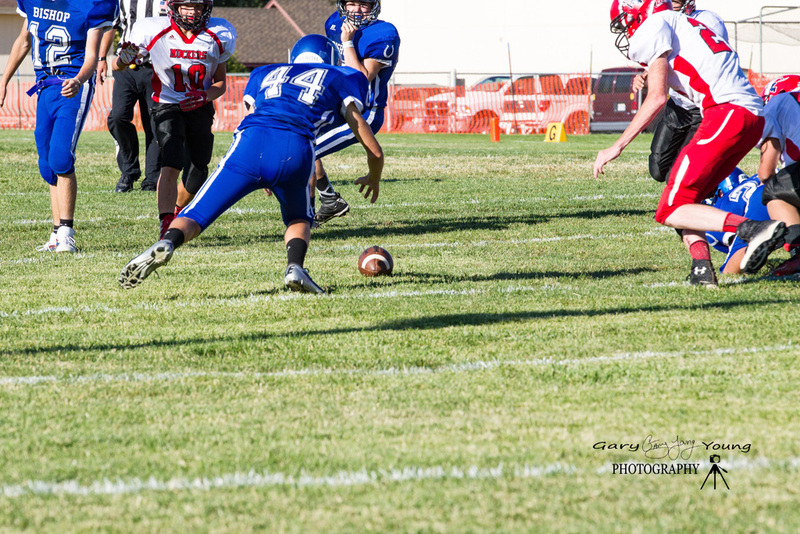 Luke McClean sack for a safety. Luke McClean Runs to the outside. Luke saves a TD run ! 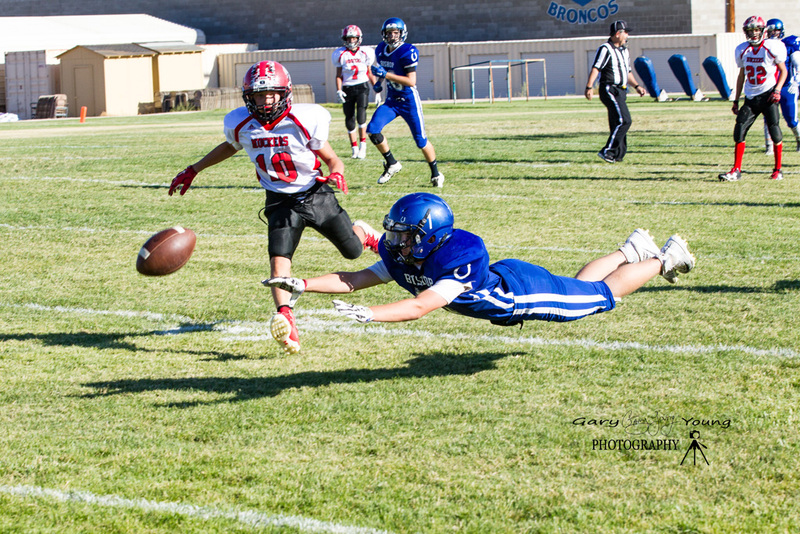 Jayden Braithwaite with a great tackle. 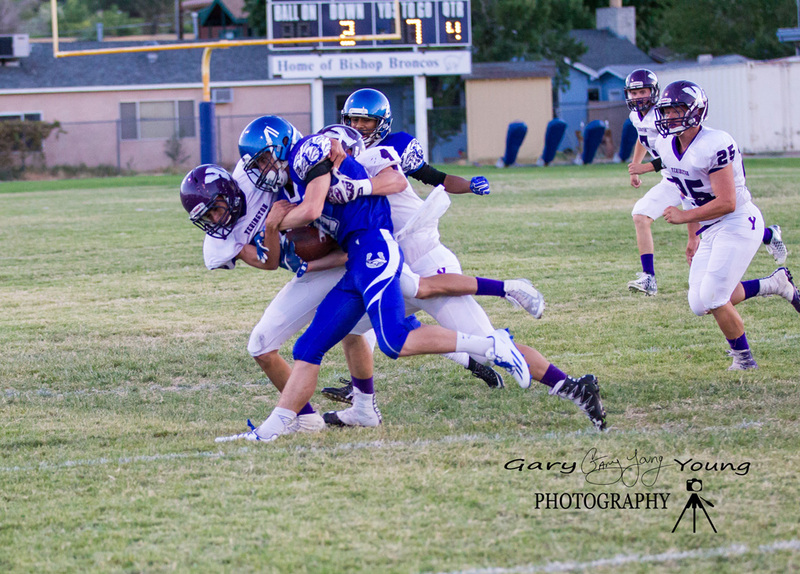 Another shot of Jayden Braithwaite helping out on the tackle. Reception down the middle for Jayden Braithwaite. All Photo’s from Gary Young Photography. 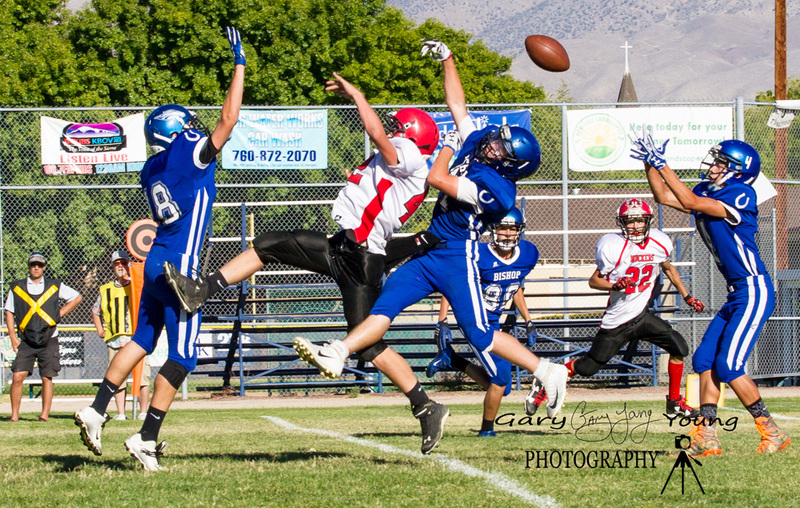 Visit Gary’s website for updated Bishop Bronco Sports Photo’s throughout the season. Bishop Union High School Football will wrap up Spring Practice Friday, June 3rd with an open practice, BBQ, parent meeting and pie auction. All Bronco Football parents, fans and supporters are welcome to attend. The “Blue and White” practice will begin at 5pm. Following the practice you can enjoy a complementary hot dog while meeting the coaching staff. Summer and fall schedules will be available and you can participate in the Pie Auction Fundraiser. All proceeds will benefit Bishop Union High School Football. 5pm start at John Schwab Field. cover photo by Lorenzo Parra. The Bishop Unified School District is pleased to announce that Mr. Arnie Palu has been hired as a teacher at Bishop Union High School. Mr. Palu will be working in the Career Technical Education department at BUHS teaching classes related to the Arts, Media and Entertainment and marketing industry sectors. His position will include journalism, media production, and student leadership. Mr. Palu will also take the helm as Head Varsity Football Coach for the Broncos. We are extremely excited to begin working with Arnie Palu here at Bishop Unified and we know he will be a great addition to an already outstanding staff at BUHS. Go Broncos! Palu, a native of Nebraska, is a graduate of the University of Nebraska, Lincoln and has served as news and sports director at KIBS/KBOV since September of 2001. 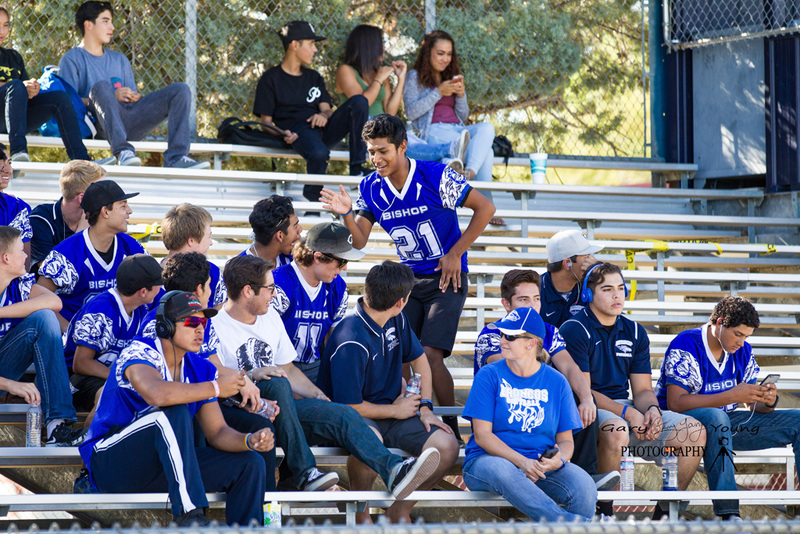 Palu has been a member of the JV football staff at Bishop Union for 8 seasons including 5 seasons as head coach. After 15 seasons as the Head Coach of Bishop Union High Schools football program, Bill Egan is stepping down. Egan will continue on as a teacher at BUHS. Coach Egan’s run at BUHS includes an overall record of 114-64 leading the Broncos to the CIF playoffs each of his 15 seasons including capturing a CIF Southern Section championship in 2010. Coach Egan’s teams won High Desert League championships 6 times. The Broncos winning the HDL crown in 2003, 2006, 2008, 2010, 2011, and 2012. Coach Egan begin at Bishop Union High School in 2001 leading the Broncos to a 6-4 record and third place league finish. 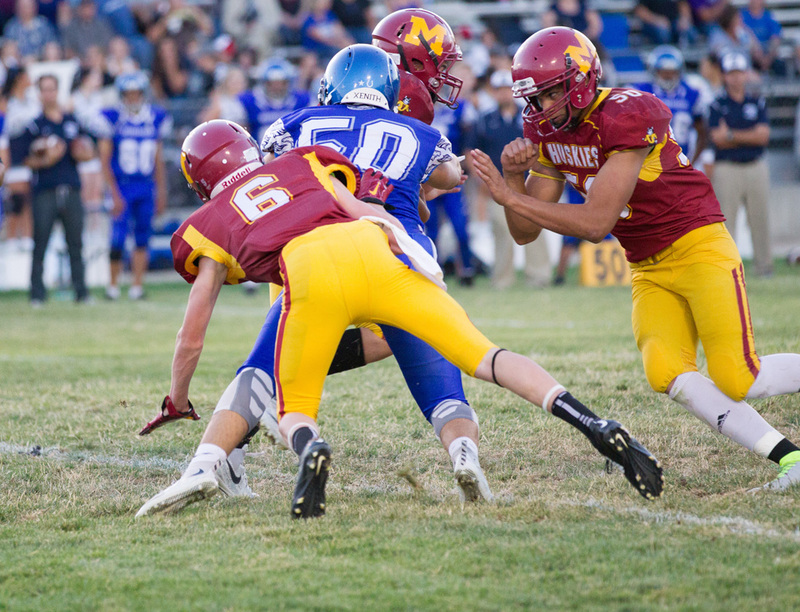 The Broncos showed steady improvement in the early 2000’s capturing the High Desert League title in 2003 and finishing with a 11-2 record. The 2003 Broncos lost to LA Baptist in the CIF semifinals 21-14, with a last second Bronco drive coming up just short. Under Coach Egan the Broncos consistently made deep playoff runs. 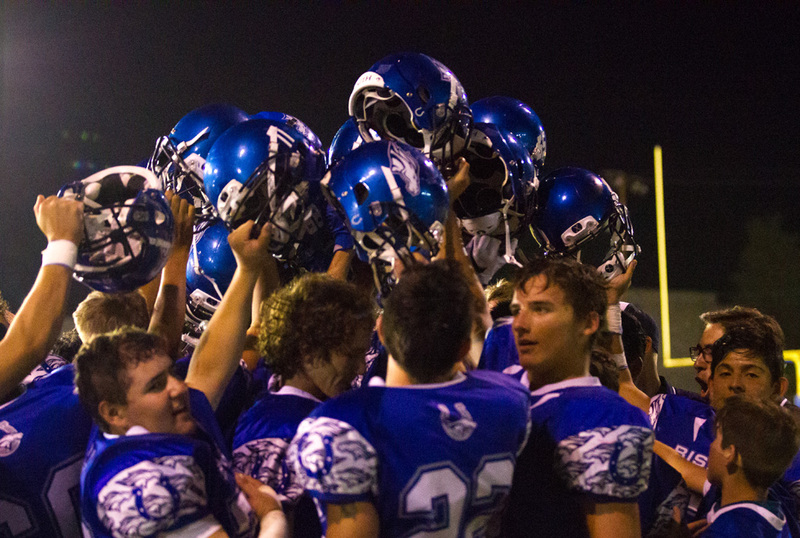 Under Coach Egan’s leadership the Broncos claimed the 2010 CIF southern section northeastern division championship. The Broncos finished 2010 with a 13-1 record. Coach Egan was named the CIF SS Northeastern Division Coach of the year. Bishop’s path to the championship included sound playoff victories over Mojave (41-0), at Chadwick (49-20), and Pasadena Poly (44-14). 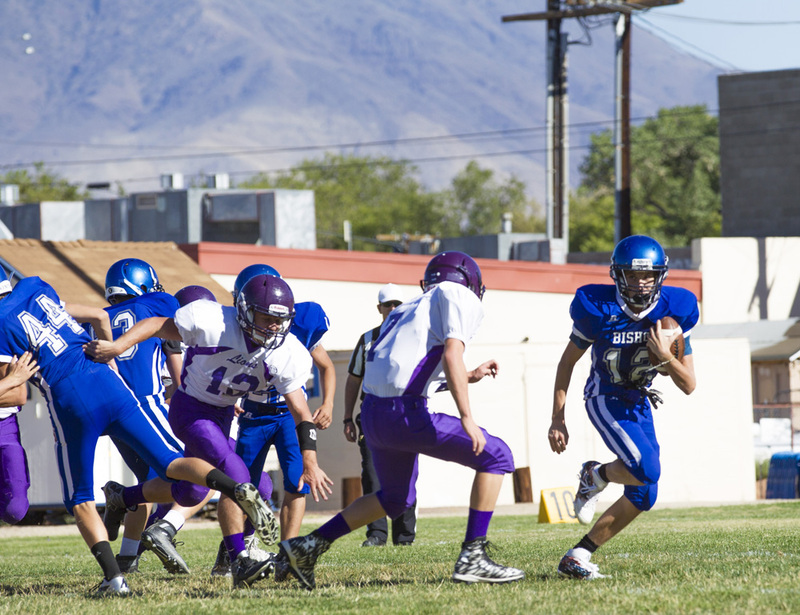 The 2010 championship game played at Bishop Union’s John Schawb field featured two public school, Bishop Union and former Desert Inyo League rival Boron. Bishop withstood a late bobcat charge winning the title game 30-22. Coach Egan and the talented 2010 Broncos delivered BUHS their second CIF football title, the first coming in 1957. Coach Egan is always quick to thank his wife Maggie for her support. Mrs. Coach, as referred to by Bronco players, has served side by side with Coach Egan. Maggie has provided countless hours to the Bronco football program serving in every possible way. From organizing and running fundraisers to baking the famous “Bronco Brownies” and everything in-between. Maggie was a pillar of the Bronco sideline the past 15 seasons delivering water at time outs and providing tender care to injured Broncos. A highlight of what I expect was a roller-coaster of emotions-type day at the Egan home, the Medical Staff at Bishop’s Northern Inyo Hospital presented a $10,000 check to Maggie Tuesday. The generous donation is headed to City of Hope for Cancer Research. Ups and downs no doubt…but also a huge impact, no doubt. Coach Egan and Mrs. Coach leave large shoes to fill at the Bishop Union High School football program. 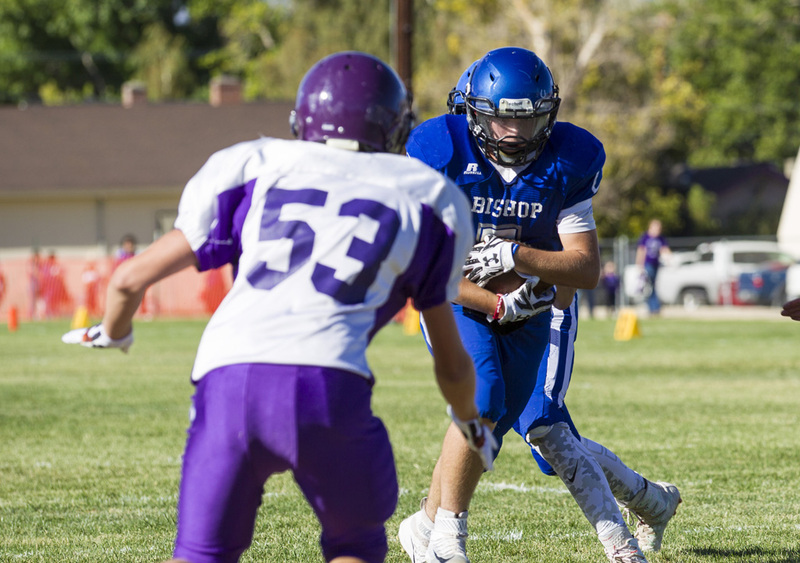 Bishop Union High School Football places five players on the High Desert Leagues 1st team, and seven more on the second team. Bishop Union finished third in the High Desert League behind champion Kern Valley and runner up California City. The future looks bright for the Broncos with 8 of the 12 Broncos honored returning next season. 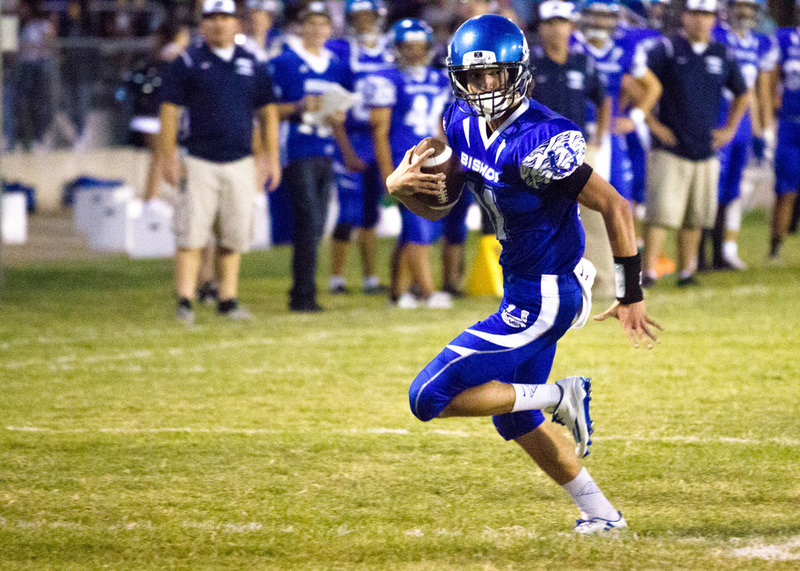 The HDL coaches named Kern Valley quarterback Zach Bushling “Offensive player of the year”. 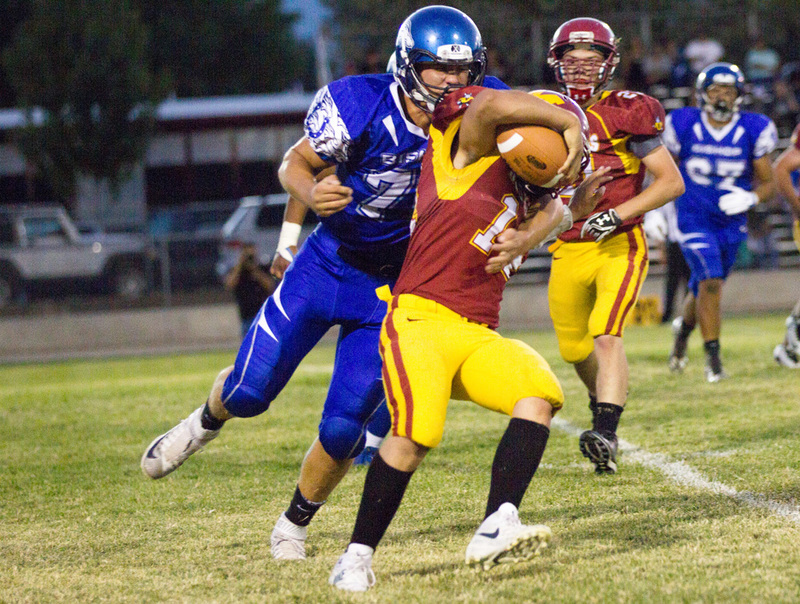 California City’s defensive standout Kevion Seals earned “Defensive player of the year” and Kern Valley’s Blake Lanterman was named “Lineman of the Year”. Ryan Rennie, junior, defensive end. 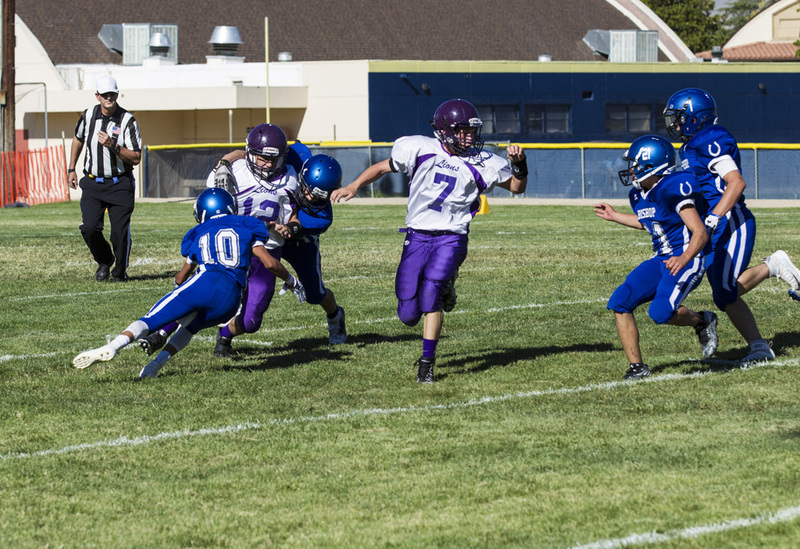 #70 Ryan Rennie makes the tackle vs. Kern Valley. 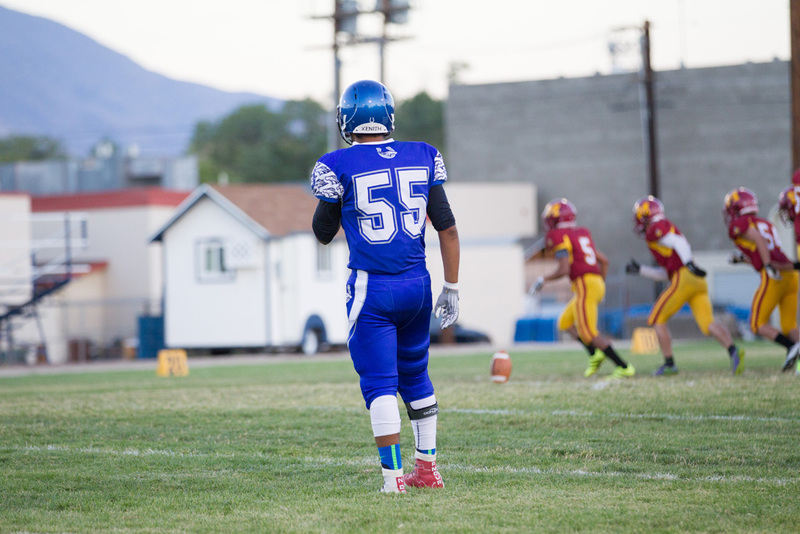 Alan Torres, junior, defensive back. Austin Jones, senior, defensive back. 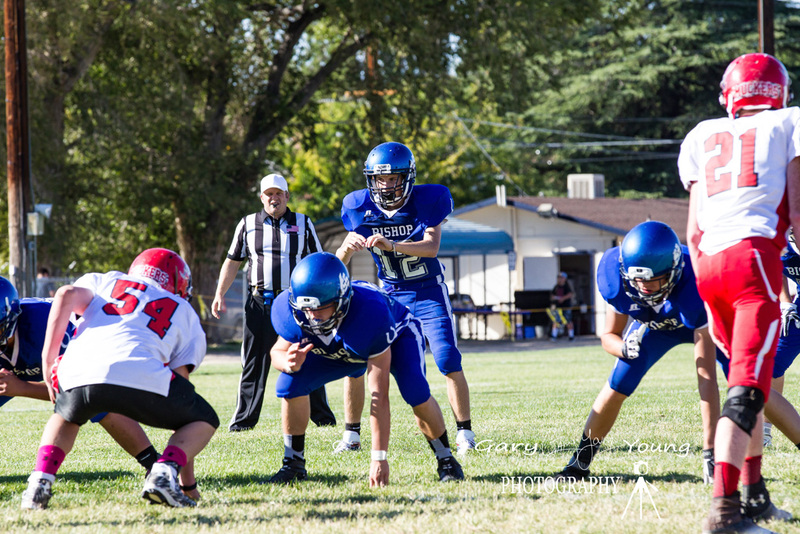 Noah Conner Becket, junior, defensive end. Martin Tiernan, senior, defensive back. Defensive back, Kyle Feaster, CC. 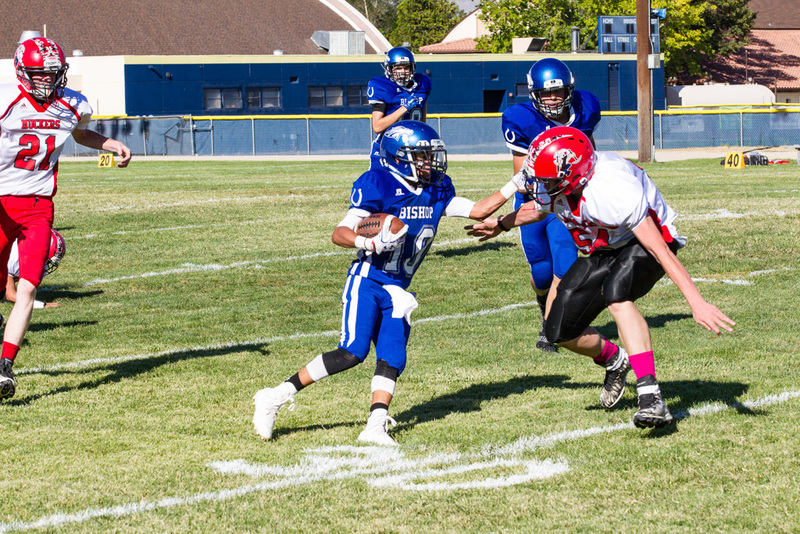 Defensive back, Pablo Valadez, KV. 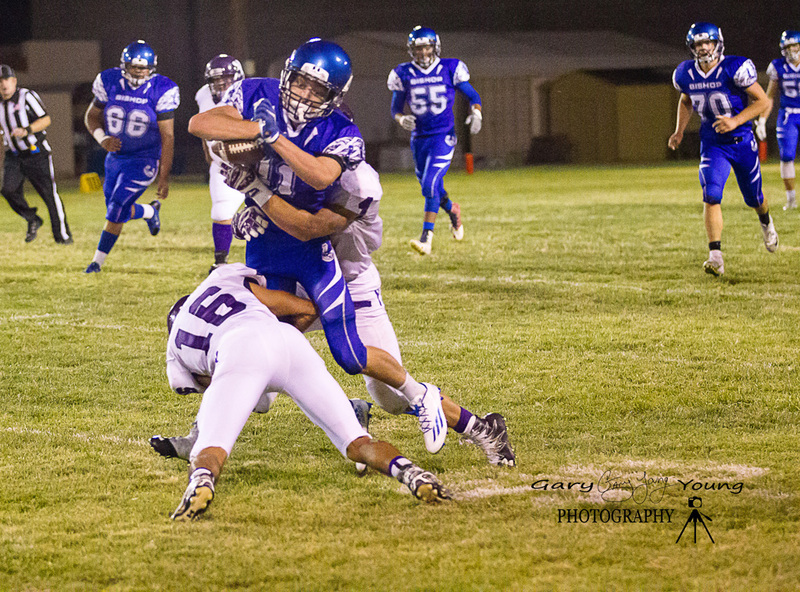 Defensive Back, Alan Torres, BUHS. 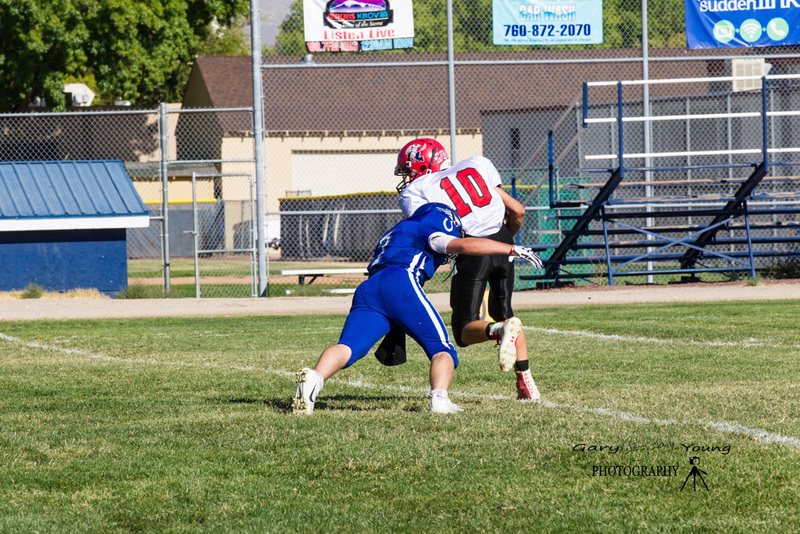 Defensive Back, Austin Jones, BUHS. Defensive back, D’Anthony Banks, CC. 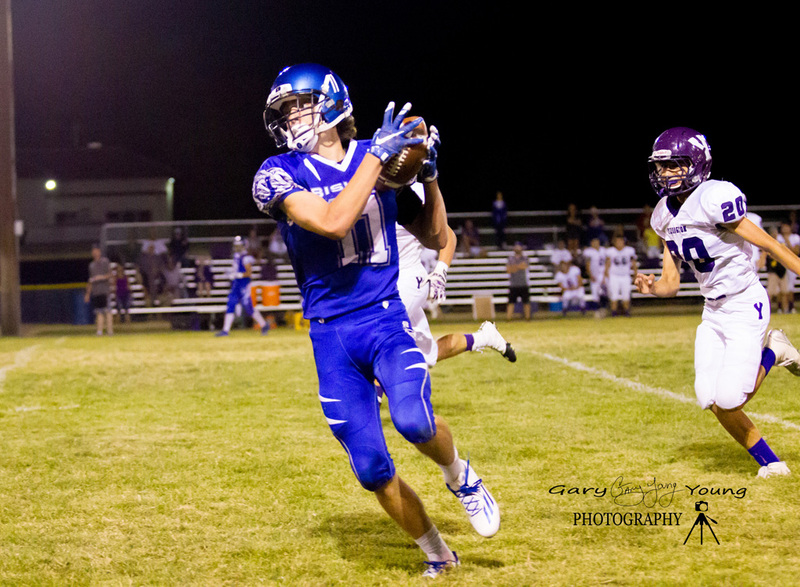 Defensive back, Zach Sietsma, KV. Defensive back, Elias Masud, FM. Defensive back, Ty Jones, CC. Mendota used a quick start and a strong finish downing the Bishop Broncos 41-14 in the CIF Central Section Division 5 playoffs. The Aztecs (7-4) jumped out to at 12-0 lead and outscored the Broncos (4-7) 21-0 in the second half. Mendota will now face #2 seed Fowler High School in Fridays second round. 8:49, Junior Cardenas 17-yard pass to Julian Cardenas. 6-0 MHS. 3:01, Christian Quintanar 64-yard run. 12-0 MHS. 0:17, Ryan Graves 15-yard run. 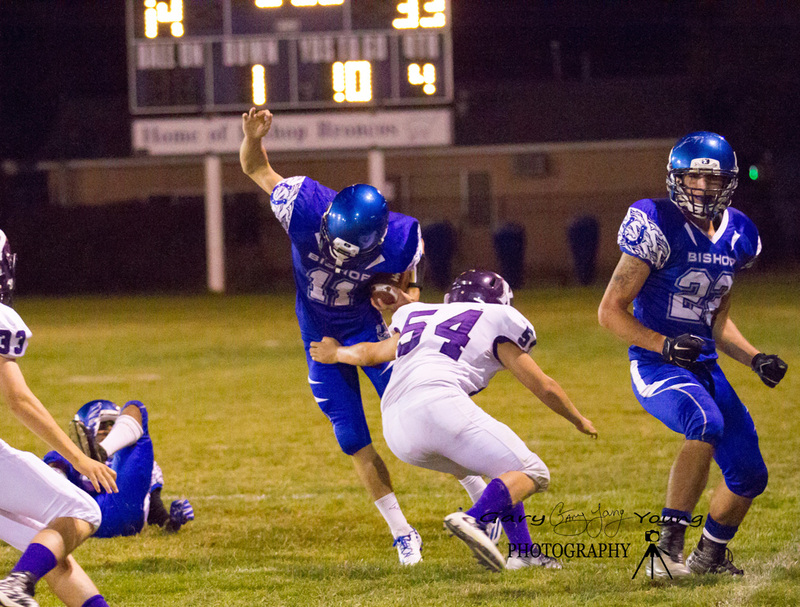 PAT kick Ethan Lamb. 12-7 MHS. 8:46, Junior Cardenas 25-yard pass to Luis Mojarro, 2pt conv. 20-7 MHS. 0:32, Ryan Graves 5-yard pass to Hunter Kampmoyer, PAT, Lamb. 20-14 MHS. 8:32, Erick Segura 46-yard run, 2 pt conv. 28-14 MHS. 4:27, Rasmussen 3-yard run, PAT by Felipe Aguilar, 35-14 MHS. 11:35, Luis Mojarro 42-yard run. 41-14 MHS. The Broncos end the season with a 4-7 record and say goodbye to ten seniors. Pregame National Anthem. Photo by Jimmy T.
Coin Flip. Bishop Captains, #32 Marty Tiernan, #12 Austin Jones, #8 Hunter Kampmoyer. Photo by Jimmy T.
Coach Bill Egan, staff and players prepare for the senior send off. 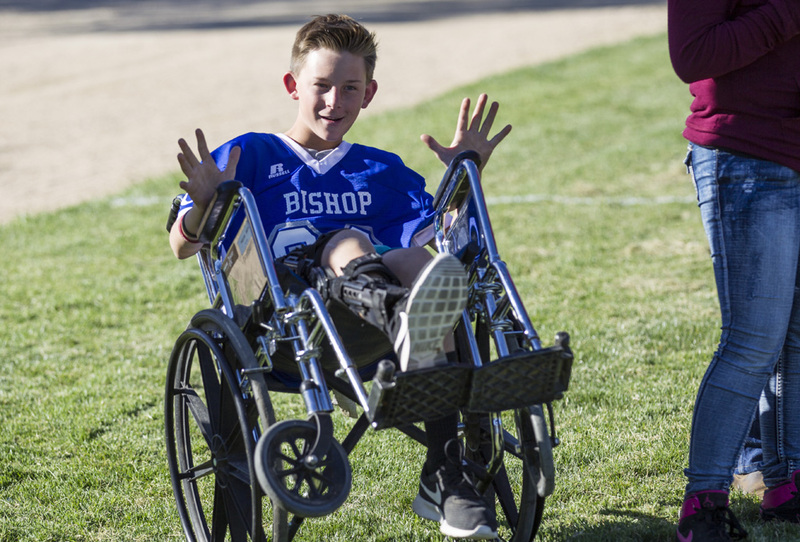 “Once a Bronco, always a Bronco!” Photo by Jimmy T.
Bishop Union High school football took a 14-3 halftime lead into the locker room Friday Night. 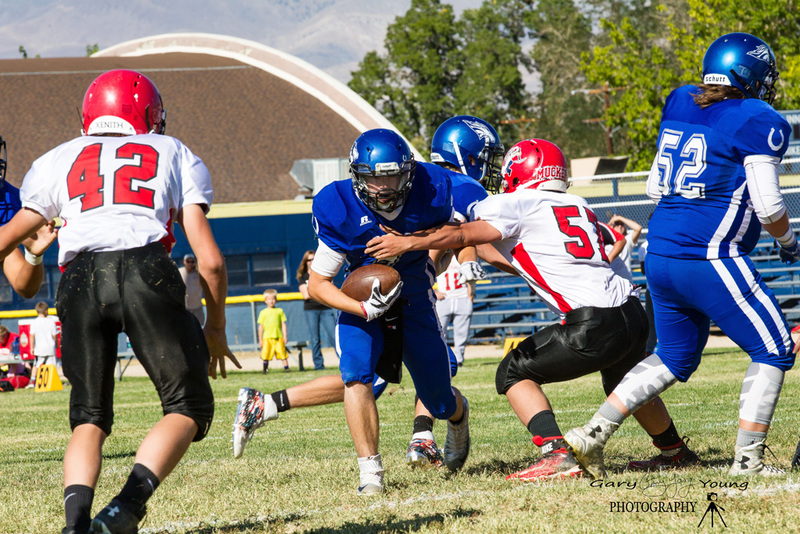 In the second Kern Valley Senior Sammy Adams started the KV revolution. 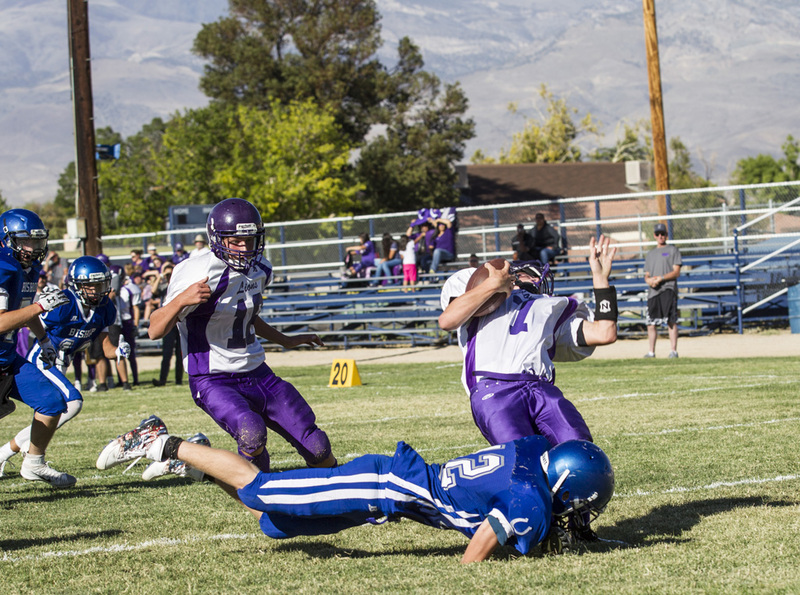 Adams founded the Kern Valley comeback with a series of big plays starting with returning the second half kickoff 85-yards for a touchdown. Adams second half heroics included jarring a would be touchdown pass from a Bronco receiver, scoring the go-ahead touchdown with 3:42 to play, and picking off a broncos pass in the final seconds putting the game on ice. Kern Valley wins the HDL title with a 17-14 win. Football is a team game, but Sammy Adams owned the second half of this rivalry game. Kern Valley fans will surely be toasting Sam Adams for years to come when they remember their 2015 High Desert League Championship. 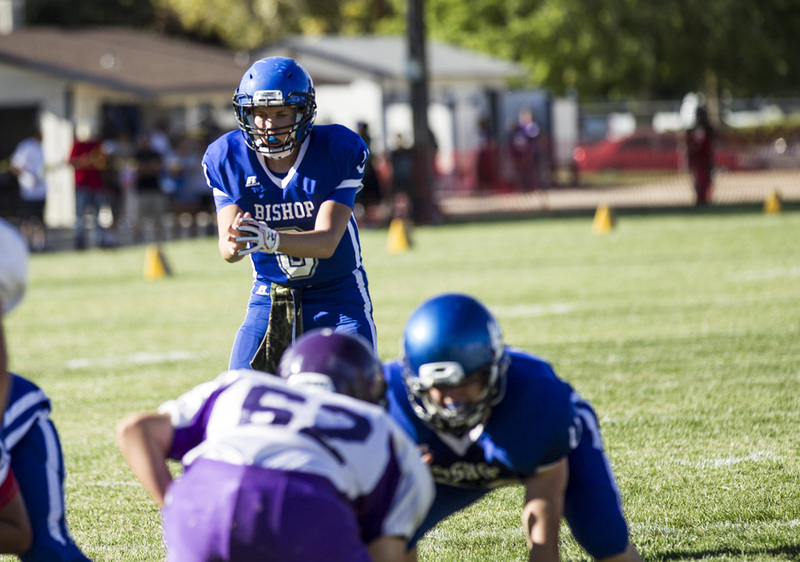 Bishop Union now must turn the page and get ready for the postseason. The Broncos finish the regular season with a 4-6 record including a 2-2 mark in the High Desert League, good for third place behind KV and runner up California City. The Broncos are the #10 seed in the CIF Central Section Division 5 Championships. BUHS will travel to #7 Mendota High School Friday, November 13th. Fowler High School, the #2 seed, has a bye into the second round. 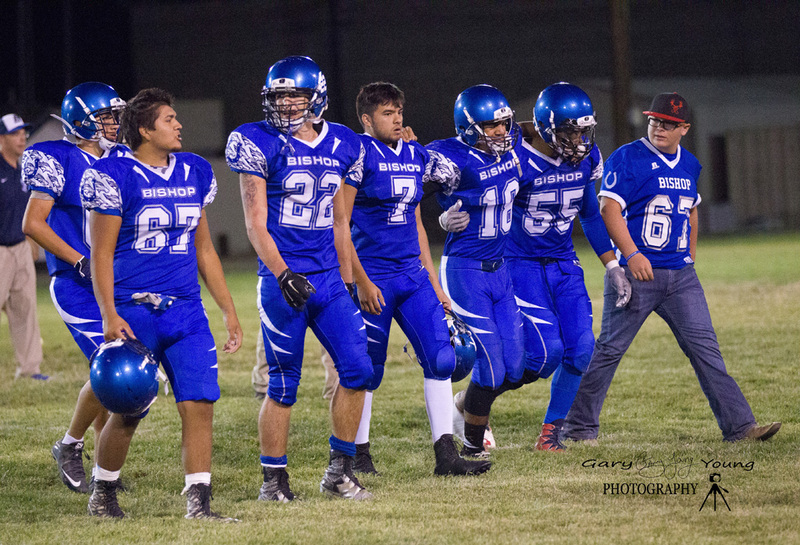 The winner of the BUHS-Mendota game will travel to Fowler for the Quarterfinals Friday, November 20th. Friday’s opening round game will be broadcast live on AM 1230 KBOV, and streamed live at kibskbov.com through the listen live link, kickoff is set for 6pm. 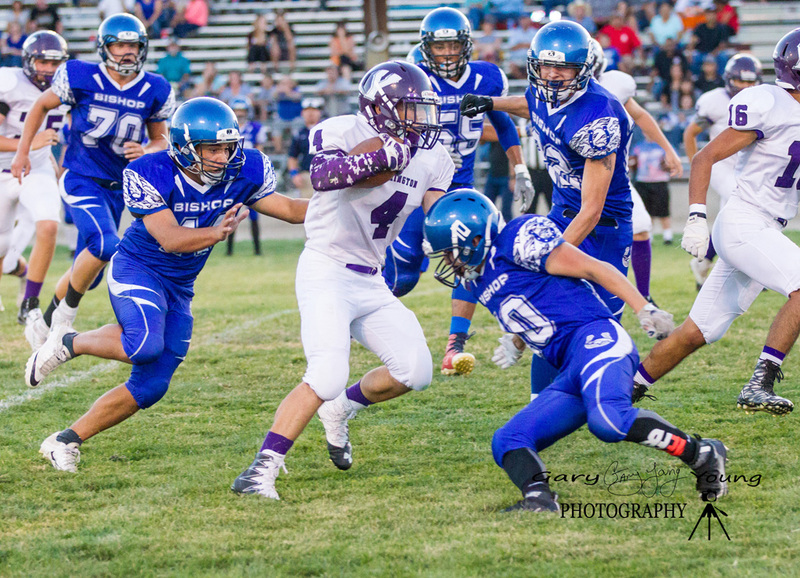 Mendota has a 6-4 record and tied for 2nd in the West Sierra League. Mendota is located west of Fresno just 368 miles from Bishop. #55 Joe Mayhugh blocks for #32 Marty Tiernan. Marty’s 30 yard run set up a 1-yard Ryan Graves 2nd quarter TD run. 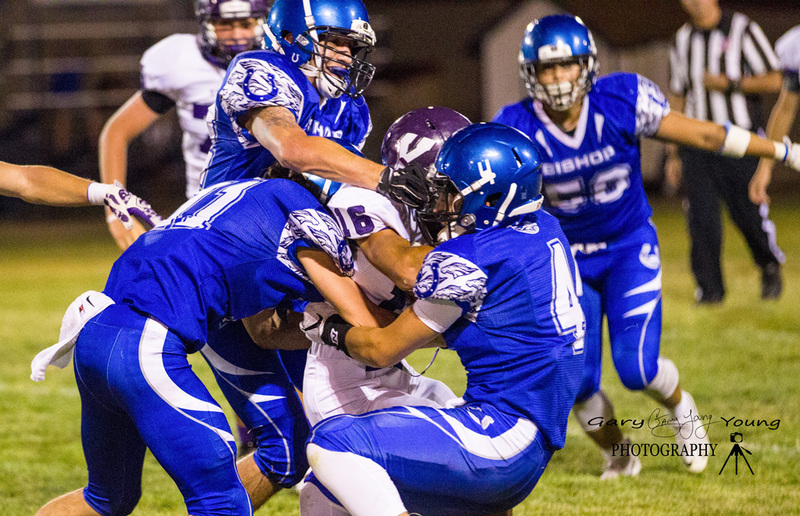 #70 Ryan Rennie and #31 Angel Santana close in on #12 Jacob Lightner. #55 Joe Mayhugh blocks for #4 Ryan Graves. KV’s #32 Austin Hurley closes in. #8 Hunter Kampmoyer scores a 1st quarter TD. #22 Sean Brown returns the opening kickoff. 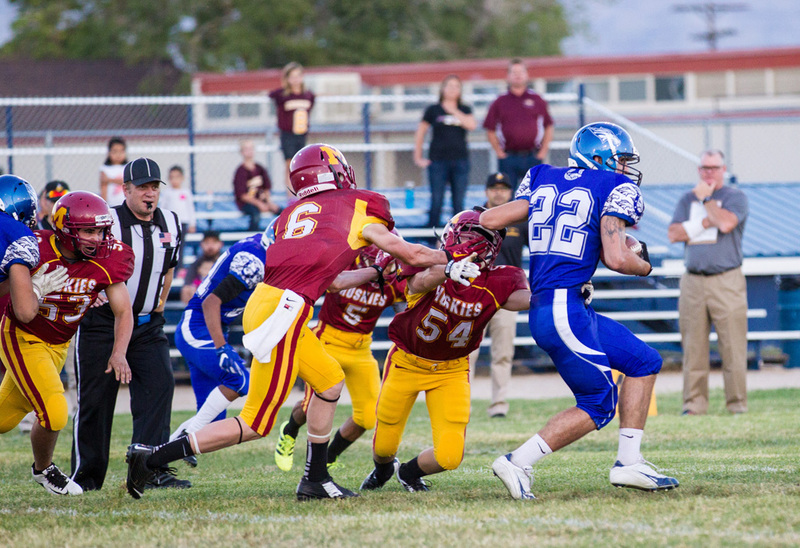 #24 Mike Molina tracking down #12 Jacob Lightner. #25 Sammy Adams delivers a big hit on 4th down. #12 Austin Jones is the intended receiver. 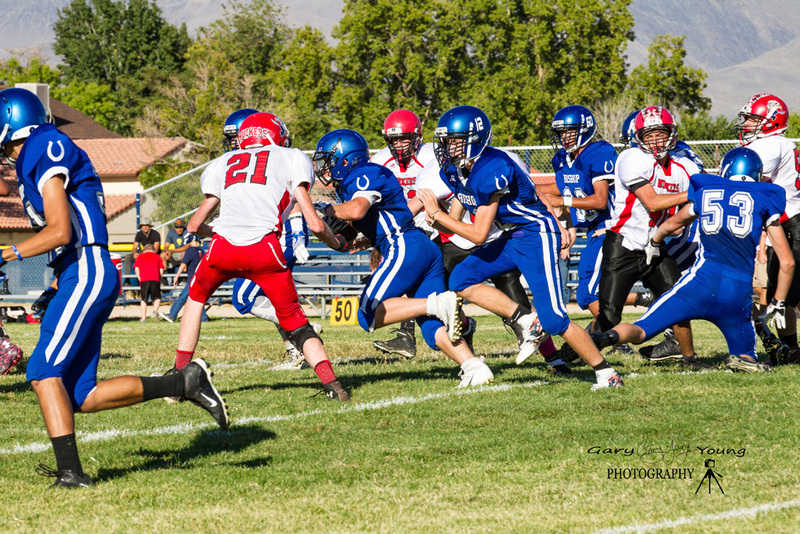 #25 Sammy Adams pulls away for the game winning touchdown.